Alexander McQueen 2013 eyewear collection highlights the brand’s classic yet unconventional aesthetic feel: iconic detailing such as metal studs and refined feather-like textures that is synonymous to the brand feature on the new range of luxury sunglasses and optical frames. These new models are a showcase of innovative manufacturing techniques combining unique materials and exclusive colours. A more refined design features a acetate frame with a delicate feather-like detailing. This is offered in warm and natural shades of aubergine, green, champagne/Havana and crystal/black. The metal studs have also been used to embellish the oversize square acetate sunglasses which are offered in mauve, Havana transparent green and black. 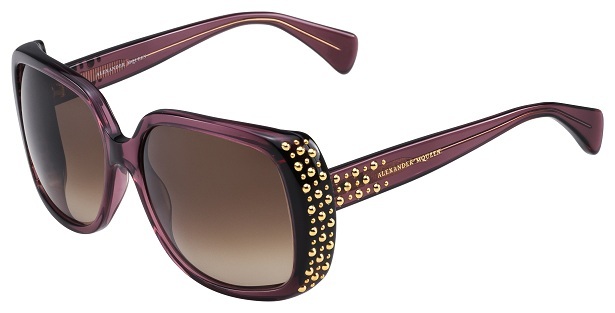 This cascade of metal studs frames the large acetate cat-eye silhouette sunglasses. Bold and seductive, this model is offered in plum, Havana, transparent green and black.